Syria War Council: Is intervention wise? 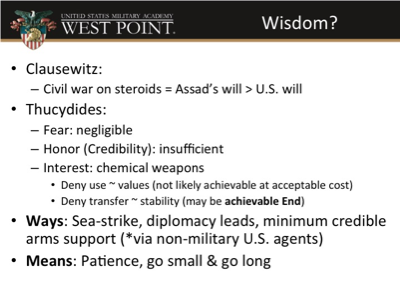 My task: What is the utility of American force in Syria – is any sort of intervention wise? To start, I don’t like the word “wise” – the battlefield punishes intellectual vanity. You will not hear me reach definitive conclusions. I don’t specifically know what to do. But I think we can advance the ball forward a bit; that’s success for me today. It is also, as Anthony Cordesman has assessed, a “clash within a civilization” – funded and fueled on one side by Saudi Arabia, Qatar and Jordan, and on the other side by Russia, Iran and affiliated groups. This provides a steroid injection to the conflict. So the regime’s will is high and has fuel. And, based on recent reporting, the American public does not possess a matching will to fight. Compared to recent interventions in Kosovo (51% approval in Gallup polling), Haiti (54%), Grenada (53%) and Libya (47%) – significantly lower support for this intervention (Ranging from a high of 42% NBC, to a low of 29% with Ipsos). It is clear that the U.S. could not be said to possess a will to fight that matches our potential opponents. But even if our public lacks will, what about the merits of the case not subject to popularity? The second test comes from Thucydides, who posited three broad reasons for going to war: Fear, Honor (read “Credibility”), and Interest. Fear: very low to U.S. physical security, including a relatively low threat to allies like Israel. Honor/Credibility: Some have said that U.S. credibility is on the line – Assad has called President Obama’s bluff. But let’s look at the past. Fareed Zakaria reminds us that “In 1983, just after the bombing of the U.S. Marine barracks in Lebanon, Ronald Reagan was certain that staying involved militarily was “central to our credibility on a global scale” and “vital to world peace.” …but a few months later Reagan was “redeploying” the Marines to ships off the Lebanese coast. That turned out OK in the end. Today: (Zakaria) Keeping our word, intervening and staying the course has done nothing with respect to deterring the North Korean and Iranian nuclear programs. This is not in direct support of a formal ally; this is a two-word statement at the end of a Presidential press conference. Credibility is not a reason to go to war in this case. Denying use: Speaks to our values – you cannot kill your own people – and you certainly can’t do it with weapons that were banned in 1925. Important interest to us, but not vital or necessary for the U.S. to succeed in the world. And we can’t accomplish this unless the President really wants us to get involved intimately with the conflict – and it doesn’t seem that we have the will to support such an engagement. Why? Big reason is because Syria has largest chemical weapons stock in entire Middle East; another is this massive refugee crisis. This part, half of President’s policy, I think, can be achieved (deny transfer) at what may be an acceptable cost – we may be able to get to these ends. I see Libya as a playbook to follow, even if there are some key differences. We pursued a limited objective with limited military means while simultaneously pursuing regime change with non-military means. And, generally, it worked (although several smart people disagree). Specific, minimum essential objectives: Sadly, I don’t think we (or the rest of the world) are prepared to do what is necessary to stop the bloodletting in this civil war – they want it more than we ever will. But we might be able to contain the worst of this from spreading to the region and world. We can deny the transfer of any of these weapons from Syria – we can make half the policy happen at a potentially acceptable cost. Suitable ways to achieve them: Sea strike platforms to punish Assad and tip his chemical weapons cost/benefit analysis. Second, diplomacy leads this effort through and through; military folks must take a back seat in Syria (tough for us to do). Third, if we want any shot at cordoning off the spread of chemical weapons, we’ll need to enlist the support of the Free Syrian Army. And the only way to do that is to provide them a credible minimum level of arms; we’ve got to scratch their backs, or others that we like far less will do so in our place. I know that further fuels the crisis, and goes directly against the humanitarian imperative, but I don’t see an alternative here. Necessary means for success: Patience and persistent, sustainable minimal investment in resources. Powerpoint slide used during remarks.